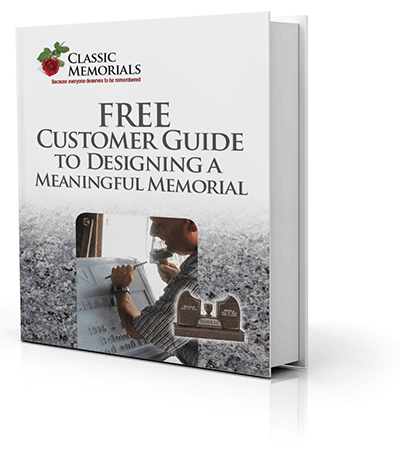 Classic Memorials is the premier cemetery monument and headstone company in Beachwood, OH. We believe every life is unique, and that your loved one deserves the best monument to accurately reflect his or her legacy. We take pride in providing families with memorials to honor the lives of those they loved so dearly. Classic Memorials is a fourth-generation family-owned business, specializing in custom headstones. Our artist and president, Val Konstantinovsky, is a Certified Memorialist® – a designation held by fewer than 110 people in North America. He applies 45 years of experience in hand-etching and engraving to create detailed, distinguished headstones and monuments. His quality work has been featured by “MB News,” “Stone in America” and Cleveland.com. Family Memorials/Mausoleums: We consult with your family to determine the appropriate design, features and capacity for your unique structure, then use the finest granites to construct a mausoleum that beautifully memorializes the legacy of your family. Hand-Engraved Portraits: Our Certified Memorialist®produces custom monuments with such details that it appears as if a photo was etched in granite. Engraving at the Cemetery: Classic Memorials has strong relationships with Cleveland and Northeast Ohio cemeteries, with complete knowledge of their rules and regulations. Monument Duplication: Our detailed designers can replicate a previous monument to meet your loved one’s wishes or continue a family tradition. Pre-need Memorials: While pre-planning may be difficult, it saves your family from the emotional and financial burden and provides the freedom to choose exactly what you want in your memorial. Bronze Markers: Using only the best materials, we’ll help you choose a quality design and style for your bronze marker to appropriately honor your loved one. Cleaning and Restoration: Over time, gravestones and monuments become stained by the elements. We have developed Forever Clean™, a 7-step proven and safe approach to effectively maintaining headstones and monuments. Our full services include cleaning, gravesite care and plot decoration. Classic Memorials considers it an honor to serve the residents of Beachwood, OH with top-quality custom monuments and detailed workmanship, at a reasonable cost. Locally owned and operated, we consider ourselves very much a part of the inviting Beachwood, OH community. Classic Memorials loves working in this attractive town, and we are committed to our continued service to Beachwood families, helping them remember their loved ones with beautiful memorials. For more information on Classic Memorial’s monument and headstone services in Beachwood, OH contact us today at 216-321-6740.